Summer solstice was on June 20th!! I am so happy that it is finally Summer! It seemed like it was never going to come but we are having beautiful weather at last! We were having a heatwave here in Sudbury last week but then it changed to stormy weather and now the weather is perfect! Not only does Summer bring nice weather here in the North, but it also brings feelings of possibility, opportunity, and pure bliss. For my Summer playlist, I decided to make it extra special and double the number of songs. So, instead of the usual 15 songs that I add to my seasonal playlists, this one has 30 SONGS!! Woohoo! Lots of songs to enjoy all Summer long! You'll need them too... for listening to while you hang out by the pool... while you lie in the grass and watch the clouds... while you work on all of those Summer hobby projects that you plan to do... the possibilities are endless! All of these songs remind me of Summery things: beautiful weather, the great outdoors, lots of fun, and the feeling that anything can happen! As always, I made this playlist using Spotify so make sure that you have a Spotify account! 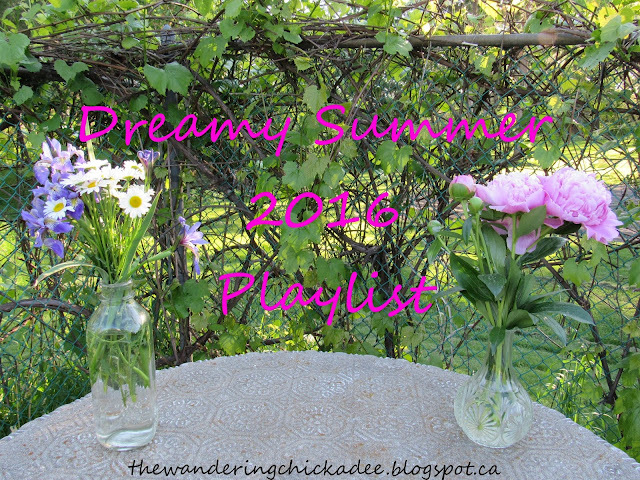 I hope you enjoy my Dreamy Summer 2016 Playlist!